Journalists and data visualization, working together with comuter scientists, researchers and artists… Visit the site at Stanford University, produced during a 2009-2010 Knight Journalism Fellowship. Journalists are coping with the rising information flood by borrowing data visualization techniques from computer scientists, researchers and artists. Some newsrooms are already beginning to retool their staffs and systems to prepare for a future in which data becomes a medium. But how do we communicate with data, how can traditional narratives be fused with sophisticated, interactive information displays? (hat tip Barry Ritholtz, The Big Picture and Flowing Data). In this post I’ll talk about some rather simple immersive tools. They have to do with what knowledge is about, with visualization and non-linear thinking and presenting. Do not fear: there’s no need for high-end graphics. The elements on which this simple immersiveness is based are non-linearity, interactivity and visualization. In the personal learning environments course #PLENK2010 you can find a discussion thread about concept mapping, with George Siemens providing a link to a paper about The Theory Underlying Concept Maps and How to Construct and Use Them by Joseph D. Novak and Alberto J. Cañas (Florida Institute for Human and Machine Cognition). Please note that I only provided a basic structure for the map – others added many nodes, provided Russian translations etc in a pure wiki-style. The reason I like those maps is that they allow for non-linear thinking and discussion. The enhance a more organic, associative way of reflecting on things. Compare having a group discussion with a linear powerpoint presentation versus a more brainstorming type of session, or at least a meeting where people are allowed to really interact and to go back and forth the points discussed – eventually adding or eliminating discussion nodes. Actually, you can use non-linear presentations derived directly from concept maps for larger audiences. A colleague of mine introduced me to an interesting tool, Prezi, which helps you to do just that. There are other examples at the Prezi site. The big advantage of a Prezi presentation, when used for an actual living audience, is that it’s very flexible and incites the group to connect ideas in ways which may even surprise the presenter. This is the virtual reading and meeting room for the connectivism courses in the virtual town Chilbo in Second Life. As pointed out in a comment on my previous post, there is a Second Life cohort (group PLENK2010) getting ready to experiment and a wiki has been launched. One of the problems is that however immersive and engaging synchronous online meetings may be, they do cost time. There are already weekly Elluminate sessions to be followed for the PLENK2010 course, adding meetings in Second Life is not self-evident. Glen Gatin on Conviviality Corners suggests to organize meetings in Second Life, enabling participants to share the same virtual space while attending the Elluminate sessions. Using UStream it might be possible to intervene (also using voice) from within Second Life. But is there enough added value in this? People in Elluminate already can use a white-board and audio, maybe even video. The experiment will have to demonstrate that sharing a same space, creating watercooler-moments before and after the meeting, leads to more engagement and immersiveness. It’s that time of the year again I start asking myself whether to register for the Massive Open Online Course (MOOC) “Connectivism and Connective Knowledge” again. I did so previous years, and even though I never managed to follow-up on the activities till the end, I always learned stuff and enjoyed the discussion with the other participants. This year it seems the course is called Personal Learning Environments, Networks and Knowledge 2010. This course is a joint venture between the National Research Council of Canada (Institute for Information Technology, Learning and collaborative Technologies Group, PLE Project), The Technology Enhanced Knowledge Research Institute at Athabasca University and the University of Prince Edward Island. Facilitators: George Siemens, TEKRI, Stephen Downes, NRC, Dave Cormier, UPEI, Rita Kop, NRC. In other words, what does it mean and how do we proceed when we use online networks, social bookmarks, collaborative video sharing and editing platforms, virtual environments, blogs and wikis (forgetting many other services and applications) in order to organize our own learning process? The question interests me a lot. The previous years however I felt the course was very much a paradise for academics and teachers. Learning of course goes far beyond that, and my own interest is more how to organize self- and group-learning later in life, independently from the educational institutions. Even though the course is about to enter the second week, there is still time to register. It is a connectivist type of (free!) course, based on aggregation, remixing, repurposing and feeding forward. It’s a bewildering experience but then again, you’re not supposed to learn and study all the stuff which is presented, it’s about using tools and creating collaboratively (I think). There are quite a few Second Life residents active in the course, just do a “second life” search in the forums! Telmea Story launched a SL group PLENK2010. This year there will be once again a Connectivism Course, starting in September. Last year Connectivism and Connective Knowledge was a twelve week course that explored the concepts of connectivism and connective knowledge and explored their application as a framework for theories of teaching and learning. George Siemens and Stephen Downes co-facilitated this innovative course. I must admit that I just lurked around a bit last year. I was fascinated by the variety of communication and collaboration tools which were being used. As you still can see on the course site there was a blog, a wiki, Moodle, Elluminate sessions, video and in Second Life the Chilbo Community organized discussions and documentation. It was a sometimes confusing experience, even for those who spent more time at the course than I did. There was a wrapup conversation about last year’s course (CCK08) which has been recorded. One of the special characteristics of the course was that there seemed to be many many attendees. A small minority I guess attended the course in the context of some formal education, others just attended (for free) because they were interested. I am not sure how many people actually went through the whole course. It is not very obvious either whether the two organizers got as much interaction between the participants as they wanted. My impression was that the whole initiative was still presented very much as a course, which made people expect also a more classical approach with professors explaining in a rather linear way what connectivism is all about. However, the course also wanted the participants to experience what it is to educate yourself in a networked world, and asking questions such as “what is the role of an expert in a networked world”. There were more mundane issues as well, such as that it is rather essential to have a good microphone if one wants to communicate effectively in this networked environment. A rather interesting question which popped up was that of “lurking”. Is it a failure when many people seem to be lurkers rather than active participants? Are they damaging the network by doing so? Or are they rather preparing themselves for the interaction, going through an important experience? Discussion about words often are discussion about fundamental issues. Should we call the course a course, or rather workshops, or a series of events, regularly organized connections? But how would an university based on a conversation model look like? Stephen Downes talked during the wrapup about serialized courses that you can subscribe to whenever you want and that will be delivered to you through RSS in the days and weeks that follow. Course content is prepared by a designer and then arranged for delivery over a period of time – serialized – according to your schedule. RSS feeds can include links to external resources, embedded photos and videos, and community features. Course content is therefore distributed across the web. Participation is also distributed. To take a course, simply subscribe to an RSS feed – there’s no registration fee, no sign-up, no overhead. If you decide, you can submit your own blog address or RSS feed and contribute your comments and content to the course. George Siemens shared some insights and ideas about assessment. Now it was already a case that participants in the course were not necessarily evaluated by the University of Manitoba, but eventually by other universities who looked at the learning experience form their perspective. What can assessment be in a networked world? Maybe a service such as evaluating how much of the required knowledge and skills you have for a certain profession and indicating what you still have to do in order to acquire the total package of needed skills? The wrapup was for me very similar to my experiences reading course material and sporadically following course discussions: almost no clear answers but lots of questions. But that is of course a philosopher’s paradise. Where journalists need to present complicated situations in a simpler and more understandable way, philosophers show the complexity behind seemingly simple situations. Anyway, I look forward to the new edition of the course. I hope I’ll have some more time now to participate, instead of just lurking! I signed up for the Second Life Cohort of people attending a course about Connectivism. The social tools used as well as the content of the course seem very interesting. Connectivism and Connective Knowledge is a twelve week course that will explore the concepts of connectivism and connective knowledge and explore their application as a framework for theories of teaching and learning. It will outline a connectivist understanding of educational systems of the future. George Siemens and Stephen Downes – the two leading figures on connectivism and connective knowledge – will co-facilitate this innovative and timely course. Connectivism is driven by the understanding that decisions are based on rapidly altering foundations. New information is continually being acquired. The ability to draw distinctions between important and unimportant information is vital. The ability to recognize when new information alters the landscape based on decisions made yesterday is also critical. * Learning and knowledge rests in diversity of opinions. * Learning is a process of connecting specialized nodes or information sources. * Learning may reside in non-human appliances. * Nurturing and maintaining connections is needed to facilitate continual learning. * Ability to see connections between fields, ideas, and concepts is a core skill. * Currency (accurate, up-to-date knowledge) is the intent of all connectivist learning activities. * Decision-making is itself a learning process. Choosing what to learn and the meaning of incoming information is seen through the lens of a shifting reality. While there is a right answer now, it may be wrong tomorrow due to alterations in the information climate affecting the decision. Connectivism also addresses the challenges that many corporations face in knowledge management activities. Knowledge that resides in a database needs to be connected with the right people in the right context in order to be classified as learning. Behaviorism, cognitivism, and constructivism do not attempt to address the challenges of organizational knowledge and transference. Very nice, maybe, but others might say pretty obvious statements. However, attending the course could very well make things more interesting, not only because of better and more explanations by the experts, but because of the learning experience itself. Social tools: The learning experience will be mediated by all kinds of social media tools. On the blog for this course I read that by the end of July 1,200 persons signed up for the course, which means that the course can be rightly called a MOOC or Massive Online Course, which makes it even more necessary to make clever use of social media technology. Each week the course will include a series of readings, recorded presentations and podcasts. During the week, a “live session” will be held in elluminate. These sessions will include a combination of presentation and discussion. Asynchronous discussion will be held in Moodle. All events will be open to the public. – Hold group or individual conversations in voice chat. – Submit builds, objects, models or other projects as assignments for the Connectivism course. – Invite other members of the Connectivism course to come visit our location in Second Life. The Chilbo community is hosting the land and space in Second Life where the SL Cohort of the Connectivism course will be held. When the Chilbo Summer Fair wraps up at the end of August, the fairgrounds will be torn down to make way for the construction of the Connectivism Village. 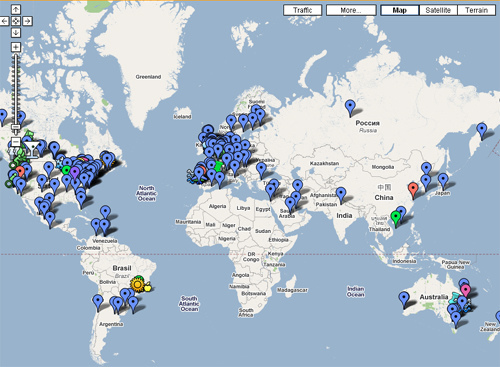 In the SL Cohort there are more than 100 people now from all over the world. That is yet another fascinating aspect of the MOOC: people from all over the planet will gather in this experience. Will it succeed? I sure do hope so, and will report about the Connectivism course here on MixedRealities.